Anyone who's ever had trouble finishing a video game will garner immense satisfaction from reading this book. Five years prior to the start of the novel, James Halliday (a Jobs/Wozniak/Zuckerberg kind of figure), days after his death, set the world alight with a quest to inherit his fortune. Playing online, billions of people have tried, and all so far have failed. Except, sort of, for one. It sounds good! It really does. Having been one of those people, trapped in their game for hours, days, or even weeks, until throwing the cartridge at the window and hoping somebody else could move to the next stage, it serves me well to read a story which provides a satisfying pass. I want to see someone (dear god, anyone) complete their game. Which is why I quite enjoyed streaking through Ready Player One. 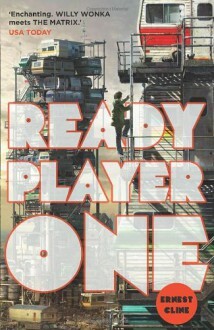 Littered with references to the Eighties (part of me was waiting for Patrick Bateman to jump out and join in on the name dropping), Cline's work is of the write-what-you-know variety, intelligently scribbled into a new world which climbs off the page and blurs into reality. We face two worlds in the novel, 'reality' and the online multiplayer 'OASIS', and they blend almost seamlessly to create a semi-automated, vibrant world of unreality, the people of Earth more interested in being logged in than locking eyes with the hottie in Starbucks. Cline's novel is witty and wistful, but by no means sharp. There are perhaps forty pages which could be tightened, at least faster paced. The mildly unnecessary romance felt... Well, not forced but somewhat unrealistic, given that it was given little to no page time. As a novel for gamer geeks, and for anyone ever wronged by a game, however, it's great.